A 33" retractable banner stand that is cost effective for short term signage and promotions. It is designed with 3-part aluminum pole connected with elastic that inserts in the base and stands straight. A 33 1/2" retratable banner stand with a silver base, snap rail top and bottom, and a clip roller with an adjustable spring for ease of graphic change-outs. Height adjustment telescopic pole of 63" up to 86.6"
Kalitec Deko is a modular, 3-part outdoor signage system comprised of aluminium pre-cut sign blanks combined with a customized post and three anchor options -- permanent ground, temporary ground and deko-bloc to suit every application. Perforated galvanized telescopic sign posts and anchors for permanent signs. Super strong 1.66"inch x 6' poles to create pole banner systems. Kits contain 2 pole brackets, 2 aluminum poles, 4 stainless steel straps and 2 cable ties. The original patented standoff made for A-frame signs. Keep the sign off moisture, and using the anti-spread rope, prevent the sign from falling flat, or doing the splits. Grommets, Grommet Dies and Grommet Punches of various sizes ranging from #1 to #4. Both top and bottoms of the grommet are included in the box. Grommets are brass unless otherwise stated. SignAbracket is designed to hold corrugated plastic signs. SignAbracket can be secured to just about any support surface using a range of fixing methods and installs in minutes. SignAbracket can hold all thicknesses of corrugated plastic between 3mm and 6mm. Metal or Plastic Hinge Handles to create quick A-Frames from MDO, PVC or ACM. 24"x18", 32"x24" or 24"x36" Top Loading Metal A Frame for indoor/outdoor use. Use with foamboard, Coroplast or PVC to create instant stand up signs. Stainless steel, hollow fill stand-offs allow you to hang your rigid signs away from the wall. These metal side loading A frames are black, powder coated metal, that can be used both indoors and outdoors. Simply insert the graphic panel into the side slot of the sign and set into place. Insert sizes rage from 24Wx36" to 32Wx48H. U-Channel metal galvanized posts are simple and durable for mounting standard traffic signs. When choosing a post length it is important to remember that 24" to 36" of your post will normally be underground. Holes are drilled 3/8" diameter and are spaced 1" center. 18"x30" double-sided spinning sign attracts attention, fits standard Coroplast. A 22"x28"x60" double-sided, top loading floor stand for coroplast, foamboard or ACM inserts. Can be used both single or double sided depending on the inserted print. This white metal A sandwich board is comprised of two fixed, solid metal faces, mounted onto an A-Frame style stand. Each white metal face is 24" W x 34 3/4" H.
A black plastic spider step stake that is 8" wide x 26" high with 5" long prongs that the corrugated plastic mounts on to. Made for use with 4mm corrugated plastic. 50/box. An 8-foot long, u-channel shaped galvanized steel post with 24 pre-drilled holes. Used for light-duty sign display and for reflectors along the side of a road. A metal crane style real estate sign holder comprised of two black, powder coated metal parts that mount on top of one another. Sign size is 24" wide (up to 40"). This sign holder can also be used to display double sided prints. Metal Real Estate two post frame, comprised of two powder coated, black metal pieces that mount on top of one another. These are top loading sign frames that hold 4mm Coroplast inserts. Insert area size is 24H x 32W. Total height is either 48" or 60" depending on style chosen. Sign Link brackets are the perfect solution for installing signs to chain-link fencing and channel sign posts. Each piece is molded from glass filled nylon. Sign Link brackets installs to any fence grid size and are pre-threaded and ready to use. Step Stakes are 30"x10" H-Frames for 4mm corrugated signs. An economical 23.5" wide and 63 to 71" tall, light weight and portable banner stand that is easy to setup and pack. X-banner stand frame looks like the letter X.
Squarecade is an all plastic, durable, affordable, and versatile enough for any business needs. 36"H X 25"W X 3"D are the outside dimensions with the image display area being 24"H x 24" W.
Plasticade Simpo Signs are plastic A-frames that holds two sign faces. Simpo Sign II holds two 22" x 28" signs per frame. Simpo Square holds two 24" x 24" signs per frame. 24"x36" white double sided sandwich board frame with unique quick change feature holds signs made of Coroplast, or any other material 3/16" or less. 24" H x 36" W double sided, A-Frame, all plastic frame with solid plastic surface. Sign face can receive vinyl sheeting (with surface preparation), metal, coroplast, or acrylic sign blanks (graphics must be mounted). Can be sand ballasted. White funnel sold separately. 24"x36" white double sided A-Frame sandwich board frame with solid plastic surface with unique quick change feature holds signs made of Coroplast, or any other material 3/16" or less. Spring loaded, Quick-Change, double-sided sign frame for Coroplast inserts. Grey with black base, it resists winds of up to 60 mph. The base can be filled with sand or water and includes wheels for easy movement. Minicade is an all plastic, durable, affordable, and versatile enough for any business needs. Durable, affordable, and versatile enough for any business need. Wind Signs with Quick-Change Frame are available in 3 sizes. Windsigns with Snap Frame are available in 2 Sizes 28" x 44" or 24" x 36". The coil springs in the base resist strong winds and return the sign to an upright position. The snap frame allows for quick sign change outs - simply, snap open, place your graphics inside and snap closed. Holds six signs, two main, two sides and two top rider for 360 degree messaging. Billboard is 36" x 48" making it twice as big as a Signicade, perfect for eye-catching outdoor advertising, Six Signs per frame for 360 degree messaging. Strong, durable and lightweight plastic yard sign frames, available in various styles. All aluminum construction, with black anodized finish 14" long with a built in self-lock (no chains need)] holds up to 36" wide signs and gives your a-frame signs a Professional look. 24" wide, aluminum built, single-sided retractable banner stand with adustable height of 63" to 87". It features a snap-lock rail for easy graphic insertion. Adjustable Slider banner stand is 33.5"W x 63"- 84"H and provides a slide in graphic tab and adjustable tension ratchet make this banner unique. Comes with a two piece adjustable pole. Double sided banner stans that holds two separate graphics in 32 1/4" Wx 84" H.
Adjustable Snap-Rail banner stand is 33.5"W x 63"- 84"H. The chrome end caps contrast a satin finish base with a snap-in roller graphic bottom rail and snap-in graphic top rail. A silver, 33 1/2" x 78.75" double sided, aluminum retractable banner stand with a 3-part collapsable aluminum. Clip-in style top insert. Snap rail top comes complete with grey plastic end caps. Comes with a zippered black nylon carrying case for ease of transport. A black metal, fixed pole-style banner stand with an adjustable height center pole. Fixed top dowel and movable bottom dowel holder for variable graphic heights. Adjustable telescopic height centre pole ranges from 36" to 96" high. Single Sided Retractable Banner Stand, 33.5"x78.75"
2 mil cast, optically clear vinyl film with a optically clear pressure-sensitive adhesive. Graphics are easier to install over rivets using this traditional applicator tool. Available with a wide grip handle. 3M Wall Test Kit is a valuable tool for determining what film to use on your customer's walls. With the Wall Test Kit you are able to make this determination in as little as 15 to 20 minutes. Designed for high-speed removal of vinyl, decals, graphics and double sided moulding striping and trim. VCAT2, Roller L and Roller S are custom designed rollers to apply pressure to vinyl to flat surfaces and vehicle channels. 3M Citrus Based Adhesive Remover is an easy to use aerosol spray can that is ideal for the removal of adhesive residue or for surface preparation prior to use of an adhesive. 3M Citrus Base Cleaner is a non-corrosive aerosol cleaner used to help dissolve and remove dirt, grease, tar, and many non-curing adhesives. It cleans without streaking and has a fresh citrus scent. 8987 is a General Purpose Adhesive Cleaner in an easy to use aerosol spray format. It quickly cleans off wax, grease, oil, old adhesive, road tar, silicone, etc. Used for removing vinyl and vinyl stripes from acrylic enamel surfaces, adhesive removers cleans off adhesive residue. A large foam pad on a wooden handle makes it easy to conform heated film around rivets. The larger handle grip is designed for comfort. 3M Adhesion Promotor 111 is an isopropyl alcohol based solution used to promote better and faster adhesion of 3M VHB Tapes to various surfaces including bare metals, galvanized steel, and painted surfaces. Since surfaces and paint formulations very considerably, each application should be verified through testing. 3M Paint Protection Film Installation Gel is formulated to ease the application process of Paint Protection Film (PPF) and ensure a quality application. Finish-Line, Perf-Line & Bridge-Line Tapes are very conformable film backed vinyl film trimming tapes that achieve a clean vinyl trim cut on highly contoured surfaces. ASLAN FB1 (15cm wide) and FB2 (26cm wide) are stable wooden board squeegees with a felt edge for film application. Avery Dennison Air Release Tool Z1074 is a sharp, retractable needle in a handy metal pen style design. It is used to help release trapped air and eliminate bubbles during vinyl application. Avery branded, heavy duty black tool belt, with several pockets and adjustable nylon belts. Fits all Avery install tools sold separately. Super Strong magnets are used by vehicle wrappers when preparing and alligning graphics to vehicle. These strong magnets have handles on top to make movement easier and eliminate the use of masking tape. Set of 2. MBX Vinyl Zapper removes vinyl, decals, pinstripes, reflective tape and adhesives quickly and easily in a single operation. Performing on metal, glass, wood and fiberglass, the Vinyl Zapper strips vinyl without damaging paint or harming the underling surface. Hard card squeegee with a special wet edge for scratch free installs. The Speed Wing is designed with "wings" to enable the installer to reach areas typically out of the reach of most bump, bondo, teflon and hard cards. Soft felt block shaped squeegee designed to avoid scratching during vinyl application. Make applying vinyl and wraps easier with this large 1 5/8" diameter magnet with soft rubber coating that will not harm your graphics or substrates. Tools specifically chosen for their use during 3M PPF and Window Tint installations. Yellow, lint free application wrap gloves that reduce dirt transfer and friction when hand cutting vinyl. A collection of popular squeegees, blades and handles designed for window tint application. Safe and super effective "deep cleaning" water base solvent, works in one minute to lift silicone, wax, polymer, grease, nicotine, etc. from the surface. Rapid Remover is a non-toxic, adhesive remover that breaks down and removes adhesives in as little as sixty seconds! Rapid Tac Application Fluid provides more control over applications than ever before. it also cleans substrates without leaving residue, ensuring a contaminant free installation. Rapid Tac II Application Fluid is for fast, easy, installation of graphics. It works with a wide variety of films such as the calendered, intermediate, high performance calendered, metallic, reflective, polyester, mylar and other specialty films. Applicable for installation temperatures from -6C to +60C. Rapid Clear is the perfect end to a job well done and will make your work look it's best. Easily clean and polish plexiglass, glass, and most polycarbonates, while leaving a lustre that is sure to impress. The All-A-Board Lifter reduces the risk of injury to your operators and damage to valuable rigid substrates. One operator can easily transport and lift up to 500 lbs. EC-1300 Carbide Plotter Blade Series are 45 and 60 degree econo-blade line of plotter blades .A substitute for Roland PRC 145-0 blades. The Econo-Blade line of plotter blades is a lower cost alternative. Substitute for Ioline PN 103233. This blade is recommended for cutting material thicknesses of 4-12 mil with an offset of .0165. Replacement printheads for DesignJet printers. Replacement Printheads for HP DesignJet printers. Supplies for use with OKI W54S and W64S printers. Equipment Supplies for use on Seiko H74S and H104S printers. 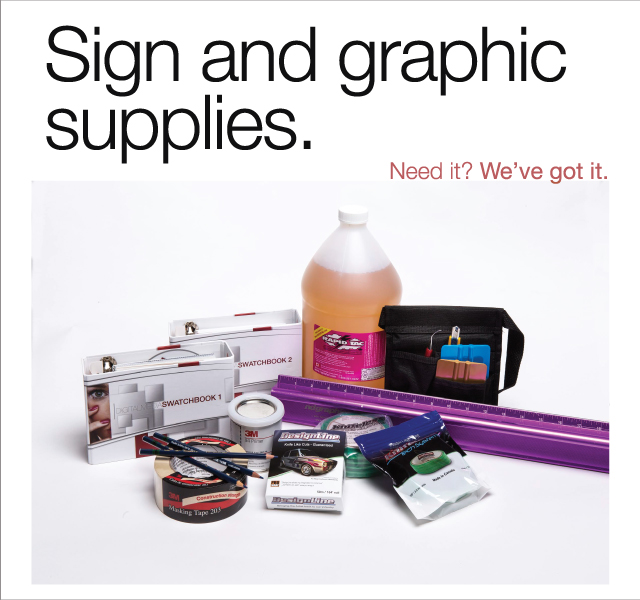 Equipment Supplies for use with the OKI E-64S printer. Carbon used in conjunction with the Captivair fume extraction system. Replacement Cutting Strips and Platen Protection Strips for Summa Plotters. F-Series Creasing Tool allows you to crease your desired media to produce various options of prototype boxes and more. An Assortment of Blades for Summa Plotters. Summa plotter pens are available in either Fiber Tip or Ballpoint Tip. 5000+ images from the best sign and vehicle graphic artists in the world. Along with the CD of .ai and .eps files, a 276 page catalogue, spiral bound with durable laminated covers is included. Templates offer accuracy, quality, consistency. Save as AI CSI or EPS files, can be imported into any vector or cutting program. Xtreme Graphic Kits are a complete solution for outputting hi-resolution print and cut vehicle graphics. Includes 1600 Backgrounds & Fills, Vehicle Wraps, Murals, 170 Large Format Digital Images with transparent backgrounds, and 800 Print & Cut Vehicle Graphics. Approx 850 tiles and full side wraps. 2 DVDs w/ref catalogue. Files in HQ .JPEGS, transparent files in .TIFF. This metal handle, twin parallel blade knife allows for cutting strips of paper, stencil or vinyl. It is also ideal for cutting gaps between the window seals and perforated window film for longer life window perf installs. An economy grade, plastic handled utility cutting knife that includes 1, 9mm snap blade. Ideal for film patter cutting and general trimming. Comes in assorted colours. NT L500GRP Heavy Duty is a 18mm, retractable blade knife with ratchet auto-lock slider which locks the blade into place while cutting. KDS L-22 Gripfit is an 18mm, auto-lock, retractable blade knife. It has a bright yellow ergonomic style yellow handle and rubber grip. Offers a locking slider mechanism that can be used with one hand. Can be used with 8pt replacement blade.